One of the most amazing things about revisiting a place after a long absence is the sense of adventure in rediscovery – what has changed, why and what is new? 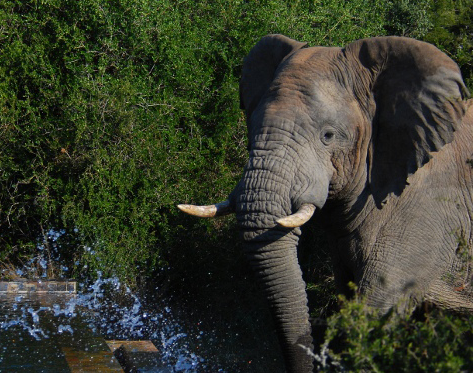 This is a short piece on my rediscovery of Kwandwe Private Game Reserve. I was based at Ecca Lodge overlooking the forested cliffs above the Great Fish River. With impeccable service, room and food, I was never going to be struggling for comfort despite the chilly winter. We dressed warmly and managed to greet the dawn and its welcome rays each morning – with the mission being to track rhinos on foot. The guides did a superb job tracking these amazing creatures over the rocky terrain where a ton or two would sometimes pass without leaving so much as a scuff mark. One morning ,whilst on the trail of a Black Rhino through the lichen-clad thickets, we stopped to hear the sound of heavy breathing – it was only later on when we saw a big male’s head popping up at the ridge crest that we realised he was mating with a resident female. Rhino’s mating is not a common sight, but on foot, surely very rare indeed. The rest of the big game was on show with a cheetah and 5 cubs, lion pride with energetic youngsters, a wide-ranging herd of buffalo and a myriad of antelope keeping our cameras clicking. But for those that know Kwandwe, you’ll be asking me about all the other things we saw, for this is what really makes this place a special wildlife destination. No shortage I can tell you. The Aardwolf were out in the day whilst Elephant Shrews and Karoo Rats were there for the beady-eyed as they sunned themselves in the early morning. Bat-eared Foxes lazed near their den; Black-backed Jackals were as busy as ever and added the vocal accompaniment when the lions weren’t roaring! Seeing 3 Cape Clawless Otters feasting on crabs in the orange sunset glow is also right up there in terms of special sightings. There were mongooses, meerkats and porcupines (yes, in the daylight too) and I haven’t even started with the birds. 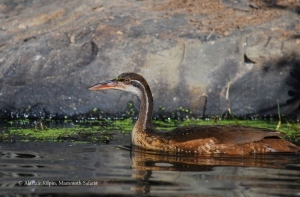 Ok, I’ll do the birds: Lanner Falcons hunting rodents, a young Pale Chanting Goshawk mobbing the enormous Martial Eagle, Knysna Woodpecker, Crowned Hornbill flocks and the endangered Kori and Ludwig’s Bustards which roamed the flats. 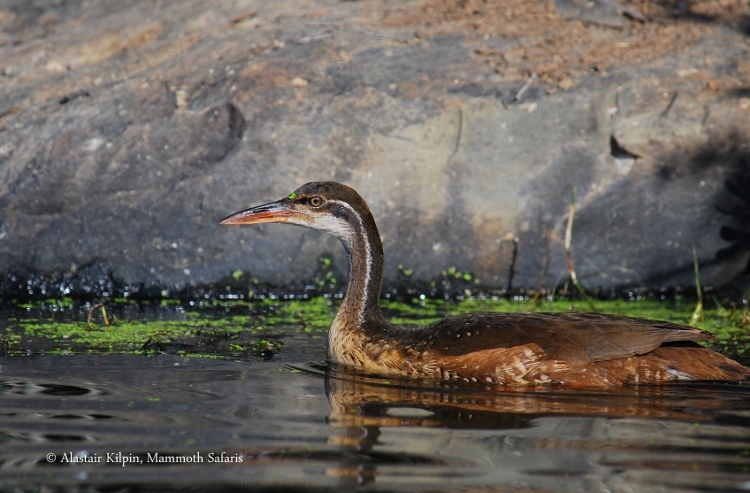 The waterbodies were also packed as the landscape dries out a little in winter – honking South African Shelduck, Little Grebes, dainty White-backed Duck, 5 species of Kingfisher and the highlight of my best ever African Finfoot sighting. I’ll leave the wonderfully rich botanical side for another day. And then because of all the large animals piling up their dung, there are dung beetles and because of that there are Mammoth Wasps – indeed – our namesake is even in the insect book – a big lifer for me! 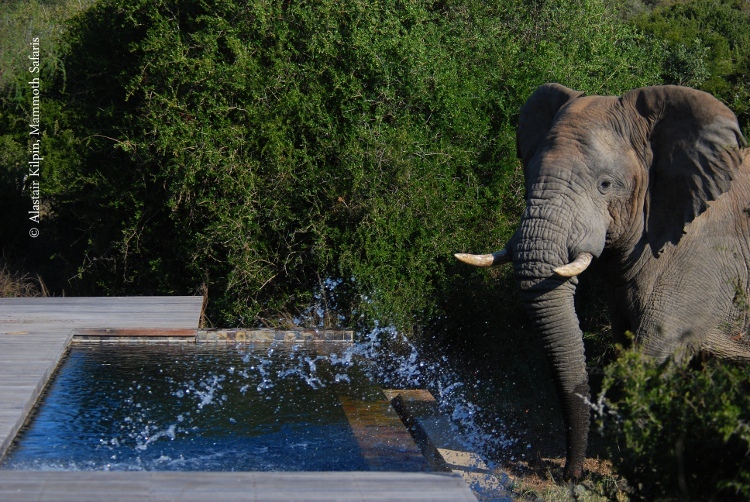 And when I did take some downtime at the pool, it was this big elephant bull that decided he did not want to share…that’s what I love about the bush! Londolozi – The Land of Leopards Do Fairies Exist?